Mad Haven are searching for a new bassist to start from June onwards. The current lineup will be playing all gigs as normal until June. We have some awesome shows booked, so far and we have plenty more in the pipeline. Our latest music video is available on application. 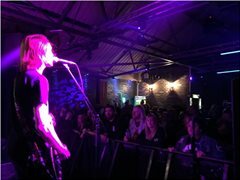 We have played in venues such as the 02 Academy & The Corporation both in Sheffield, Bootleggers in Kendal, The Live Rooms in Chester, Central Station in Wrexham, MFN in Nottingham, Nantwich Civic Hall, The Tivoli in Buckley and many more. We have some of our latest songs on music available on all music platforms and we are currently working with a record label to help us create a release plan for our upcoming single releases. We are based in North Wales with our own rehearsal studio. We take the band seriously and aim to give the crowd the best show possible, every time! If you meet the requirements or know someone that might, apply now.